The Windows Phone 8S by HTC has been announced as a mid-range, multi-coloured Windows Phone 8 handsets during a special event in New York. Following on from the launch of the HTC Windows Phone 8X, the 8S slides in below the flagship handset sporting a 4-inch, WVGA LCD display, 1GHz dual-core processor and 512MB of RAM. You'll also get a 5MP rear camera with single LED flash and 720p video recording, a FM radio, Wi-Fi, Bluetooth, A-GPS, DLNA and Beats Audio technology. Carrying on the bright, colourful theme of the HTC 8X, the Windows Phone 8S comes in a variety of two-tone shades; Domino Black-White, Fiesta Red, Atlantic Blue and High-Rise Grey-Yellow. Sadly HTC has decided against sticking NFC into the 8S, and while it's good to see a microSD card slot along side the microSIM port, you can't access the 1,700mAh battery which is locked away under the body. For those of you who love snapping pictures you'll be pleased to learn there's a dedicated shutter button on the right side of the 8S. 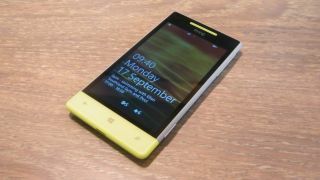 The HTC Windows Phone 8S release date and price are still unconfirmed, but the handset will hit stores in early November, with Three, Orange, T-Mobile, Vodafone, O2, Virgin Media, Carphone Warehouse and Phones4u all on board.